From the Hancock County Courthouse, go north on Hwy 15/22 for 2.7 miles. Turn right on Hwy 22 and proceed 3.6 miles to the cemetery behind the church on the left side of the road. 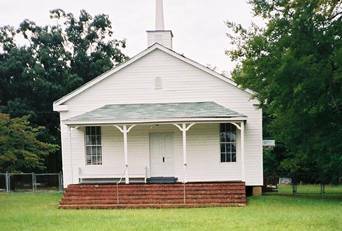 The Smyrna Methodist Church was first known as the Piney Woods Meeting House. It has the distinction of being the second Methodist Church to be organized in Georgia. Services were held in a brush arbor prior to the construction of a building in 1790. The church was rebuilt in 1800 and 1878. The original foundation of hand hewn logs joined with wooden pegs is the foundation of the present building. 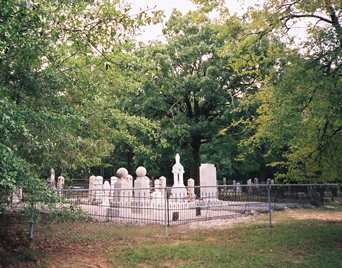 It is not known when the cemetery began, but the earliest marked grave is 1857. The cemetery was surveyed from left to right as you face the church. The graves were surveyed from front to back, with the indexer returning to the front for the next set of lots. Upright and just he was in all his ways/ A bright example in degenerate days. She hath done what she could. She lived for others. d/o John W. Waller, Sr.
Woodmen of the World Memorial, Masonic emblem on grave. w/o John W. Waller, Sr.
Father. On headstone with Mattye Mae Taylor. Mother. On headstone with Henry M. Taylor. Kind father of love, thou art gone to thy rest/ Forever to bask mid the joys of the blest. w/o Jno G. Collins. She was a kind and affectionate wife, a fond mother and a friend to all. In thee O Lord have I put my trust. w/o Rev. J. H. Little. Asleep in Jesus! peaceful rest whose waking is supremely blest. w/o Thomas J. Waller. Asleep in Jesus blessed sleep, from which none ever wake to weep. w/o Irwin N. Waller. Mother, thou hast from us flown to the regions far above. We to thee erect this stone consecrated by our love. He followed virtue as his truest guide, lived as a Christian as a Christian he died. CO E 7 GA CAV. s/o A. E. and M. C. Jernigan. From Mother's arms to the arms of Jesus. Blessed are the dead who die in the Lord, that they may rest from their labors and their works do follow them. w/o A. E. Jernigan Aged 27 years, 6 months and 27 days. She was a kind and affectionate wife, a fond mother and friend to all. w/o A. E. Jernigan. Here lies one who in this life was a kind mother, a true wife. She was by many virtues blessed, piety among the best. "Mama". "The Heart of Our Home". No death date as of January, 2003.
w/o W. T. Jackson. Thy trials ended, thy rest is won. Maiden name per Bill Jackson. His toils are past, his work is done/ He fought the fight, the victory won. May the resurrection find thee on the bosom of thy God. Aged 23 years, 6 months & 12 days. d/o Thos F. & Casander Summers. Consort of J.T. Jones & d/o Thomas F. & Casander Summers. Aged 31 yrs 4 mos & 28 ds. "Farewell" engraved on top of headstone. Aged 20 years, 7 months & 9 days. s/o Thomas F. & Casander Summers. No birth date given. Child-sized slab. w/o W. T. Burgamy. Come ye blessed. Birth and death days were not given. w/o W. D. Alsabrooks. God's finger touched her and she slept. A little time on earth he spent,/Till God for him his angel sent. 'Twas but a flower too good for earth, transplanted into heaven. Our darling one hath gone before to greet us on the blissful shore. Sleep on sweet babe and take thy rest. God called thee home, He thought best. Georgia PVT, 1CL 151 M.G. BN. 42 DIV. On headstone with Lexie S. Alsabrooks. On headstone with Henry K. Alsabrooks. Asleep in Jesus. On headstone with Elizabeth Brantley. Asleep in Jesus. On headstone with Albert F. Brantley. On headstone with Fannie Lou Long. On headstone with David Wesley Long. The pains of death are past,/ Labor and sorrow cease,/ And life's long warfare closed at last,/ His soul is found in peace. She's crossed the troubled river/ That lies twixt us and heaven; To her a robe of whiteness,/ A golden crown is given. On marker birthdate is listed as "18__." No other dates were given. w/o J. A. Brantley. A tender mother and a faithful friend. 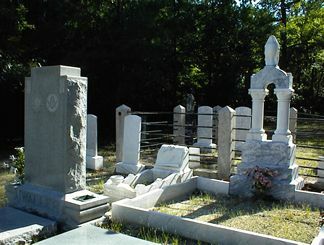 Grave is enclosed with bricks. A light from our household is gone,/ A voice we loved is stilled,/ A place is vacant in our hearts/ That never can be filled. In after time we'll meet her. Although he sleeps, his memory doth live. Dearest brother, thou hast left us here,/ Thy love we deeply feel,/ But tis God that hath bereft us,/ He can all our sorrows hear. w/o James S. Lary. She's gone to worlds above,/ Where saints and angels meet/ To realize our savior's love,/ And worship at His feet. About 25 years of age. This tablet to a brother's love/ Is reared by kindred left;/ His soul in bliss is now above,/ His friends on earth bereft. To him we trust a place is given/ Among the saints with Christ in heaven. w/o S. M. Lary. She has done what she could. Mother. No death date given. On headstone with S. M. Lary. No ostentation marked his tranquil way,/ His duties all discharged without display. On headstone with Elizabeth Lary. d/o S. M. & Elizabeth Lary. Weep not, father and mother, for me,/ For I am waiting in glory for thee. Children of S. M. & Elizabeth Lary. Our darling hath gone before to greet us on the blissful shore. On headstone with John L. Lary. Children of S. M. & Elizabeth Lary. We can safely leave our boy, our darling, in thy trust. On headstone with Elizabeth T. Lary. About 63 years of age. We shall meet again, sweet mother,/ In a brighter clime than this/ Where anguish of this world of ours/ Is lost in deathless bliss. w/o Robert E. Stapleton. Just as the morning of her life/ Was opening in to day,/ her young and lovely spirit/ Passed from earth and grief away. w/o J. N. Barnes. Error in engraving death date:"June 1, 906". w/o W. H. Brantley. A light from our house is gone,/ A voice we love is stilled, A place is vacant in our hearts/ That can never be filled. On headstone with Ethelyne J. Beckum. No death date as of January 2003. On headstone with Ashley Bert Beckum. Age 8 mos & 9 days. Gone but not forgotten. On wings of love To a heavenly home. He died as he lived, a Christian. Fieldstone marks head of grave. Two graves marked with stones. Grave enclosed with bricks. On rusted funeral home tag the name "Burgamy" can be seen along with "1920", which may be birth year. On marker with Jesse Jackson. On marker with Maude Collins Jackson. s/o Mr. and Mrs. Jesse A. Jackson. No dates. On headstone with Vera A. Jackson. On headstone with R. Crawford Jackson. On headstone with Maxine Jackson. On headstone with Herschel Jackson. On headstone with Mary Eileen Jackson. "Sweetie" on footstone. On headstone with George L. Jackson, Sr. Infant of Betty & Jesse Jackson. No dates given.